Experience the exhilaration of a thrilling microlight flight! 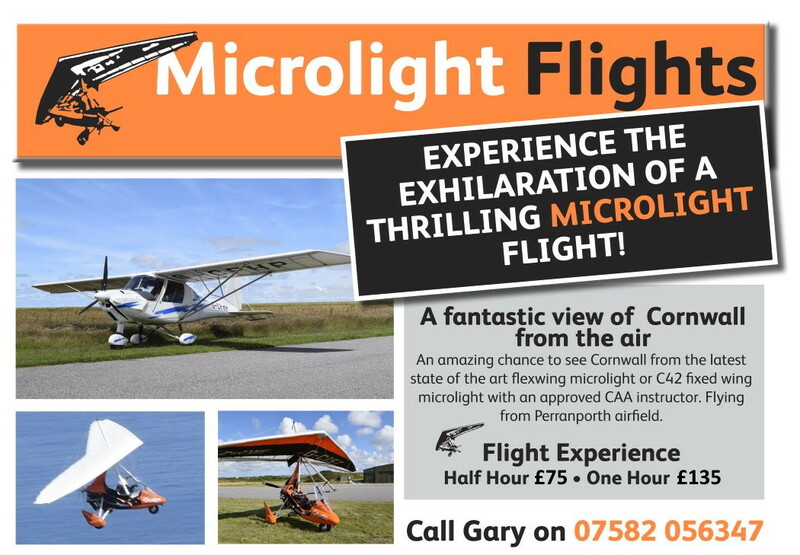 An amazing chance to see Cornwall from the latest state of the art flexwing microlight with an approved CAA flying instructor. The aircraft we use is a P and M Quik GT450 Flexwing microlight with a trim range of 55-80mph making it perfect for all occasions. Used by instructors, club pilots and competition pilots alike, it has taken it all without compromise. Holder of various world records from speed in a triangle to world record heights to winning world championships. The first Quik with a 450kg maximum take-off weight. There is an age limit of 14, a weight limit of 100kg, sensible shoes should be worn and please be patient with the Cornish weather! You are required to complete a minimum of 25 hours flying (for an unrestricted licence) of which 10 hours must be solo, including two solo cross country flights and finally General Skills Test (GST). However, it may take longer, depending on your own pace of learning and the frequency that you fly. There are also 5 multiple choice theory exams that you are required to take. The minimum age to start lessons is 14 and from there a student can go solo at 16 and then apply for a pilots license at 17 years old. Prices include equiptment hire and landings. The only additional cost is club membership with Perranporth Flying Club currently at £140 per year.